An angle grinder from DeWalt with the power and ease you've come to recognize. 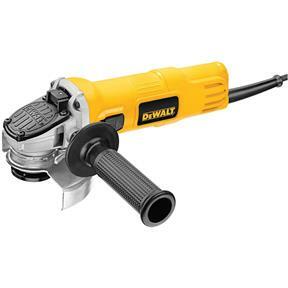 7.0 Amp AC/DC, 12,000 RPM motor designed for faster material removal and higher overload protection while the One-Touch™ guard eliminates the need for a tool to adjust the guard location. No buttons or levers, just turn the guard to position it! Low profile, jam-pot gear case increases durability and allows tool to fit into tight spaces while the Quick-Change™ wheel release allows tool free wheel removal without need for a wrench. The slim, ergonomic body design provides increased comfort in extended use applications. 5/8"-11 spindle thread accepts a wide range of 4-1/2" accessories; this grinder includes a 2-position side handle, depressed center wheel, and wrench.